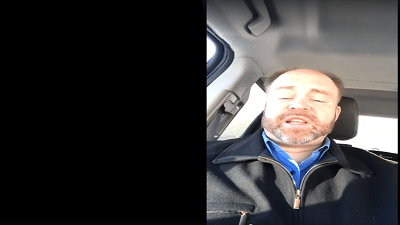 April 11, 2019 – Winnipeg, MB – KidSport Winnipeg and former Winnipeg Blue Bomber great Doug Brown have announced plans for the 10th annual KidSport Winnipeg football camp to take place on Saturday, May 11, 2019. The camp is open to athletes in Manitoba who received funding in 2018 from KidSport in order to play football. 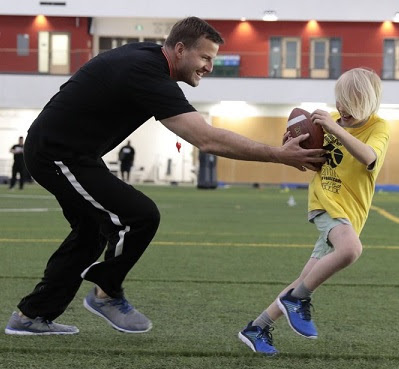 Brown, along with a number of current and retired CFL players will take kids through all the elements of a football combine, as well as position-specific fundamental drills and exercises. “Time does fly when you’re having fun. 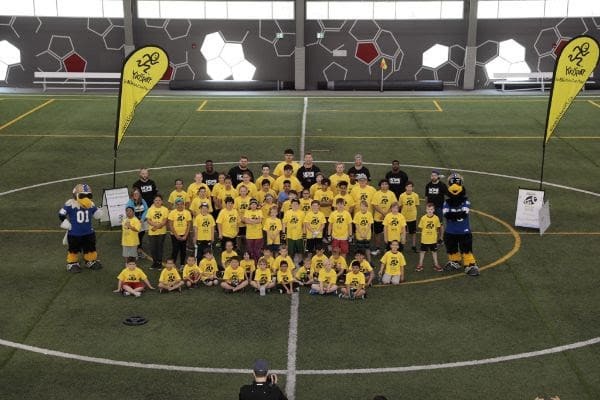 2019 represents the 10th consecutive year that the KidSport Football Camp has been in action, and to date, we’ve been privileged to have over 800 kids participate and take part in our skills and drills day,” said Brown. The camp is free to all participants and is also supported by Sexton Group Ltd., Aspire Dental, Axworthy Health & RecPlex, Boston Pizza, Save-On-Foods, Old Dutch Foods, and the Winnipeg Blue Bombers. Sport Manitoba is a not-for-profit organization and the lead planning, programming, and funding agency for the development of amateur sport in Manitoba. Located in the Canada Games Sport for Life Centre, Sport Manitoba partners with over 100 organizations to deliver sport in our province and is responsible for programs including the Manitoba Games powered by Manitoba Hydro, Coaching Manitoba, Team Manitoba, Manitoba Sports Hall of Fame, Fit Kids Healthy Kids and KidSport. Services provided include the Sport Medicine Clinic, Sport Performance Centre and the Paul Robson Resource Centre for Leadership and Coaching. Two of our favourite annual events are just around the corner, with our Coaching Manitoba Impact Awards presented by Club Regent Casino & Event Centre and Night of Champions presented by Manitoba Chicken Producers both taking place on April 13! We appreciate you adding these important recognition events in your calendar and we hope you will share the amazing stories of our inspiring athletes, coaches, officials, and volunteers as well as our newest members to join the Manitoba Sports Hall of Fame. Sport Manitoba is a not for profit organization and the lead planning, programming and funding agency for the development of amateur sport in Manitoba. Located in the Sport for Life Centre, Sport Manitoba partners with over 100 organizations to deliver sport in our province and is responsible for programs including the Manitoba Games powered by Manitoba Hydro, Coaching Manitoba, Team Manitoba, Manitoba Sports Hall of Fame, Fit Kids Healthy Kids, and KidSport. Services provided include the Sport Medicine Clinic, Sport Performance Centre, and Paul Robson Resource Centre for Leadership and Coaching. Alf Pike will be inducted posthumously in the Athlete category for his stellar hockey career that saw him star for the 1937-38 Winnipeg Monarchs who captured the Memorial Cup that season. 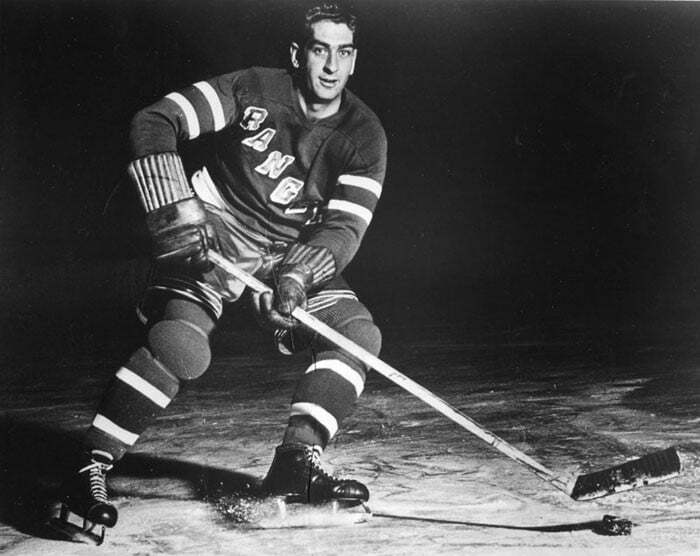 He moved up to the NHL with the New York Rangers in time to capture a Stanley Cup in the 1939-40 season. He was nicknamed “The Embalmer” as he was a licensed mortician in the off-season. After six years in the NHL, interrupted by two years’ service in the RCAF from 1943-45, Pike moved into coaching and guided the Guelph Biltmore Mad Hatters to the 1952 Memorial Cup. He also coached the 1956 Winnipeg Warriors to the WHL title and Edinburgh Trophy. He coached two NHL seasons with the Rangers from 1959-61 before returning to the WHL. He was inducted into the Manitoba Hockey Hall of Fame in 1985. 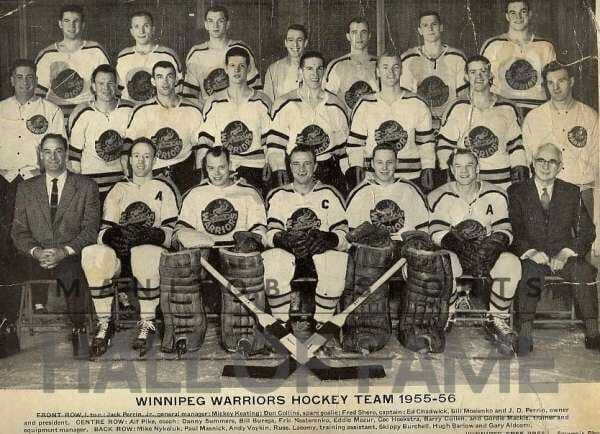 1955-56 Winnipeg Warriors will be inducted in the Team category for the sport of hockey. The Winnipeg Warriors were a minor league hockey team that played in the Western Hockey League (minor pro) from 1955 to 1961. Owned by Winnipeg’s prominent Perrin family, the Warriors represented the return of professional hockey to Winnipeg after a 27-year absence. In 1955, the Warriors Club was the first tenant in the brand-new Winnipeg Arena. 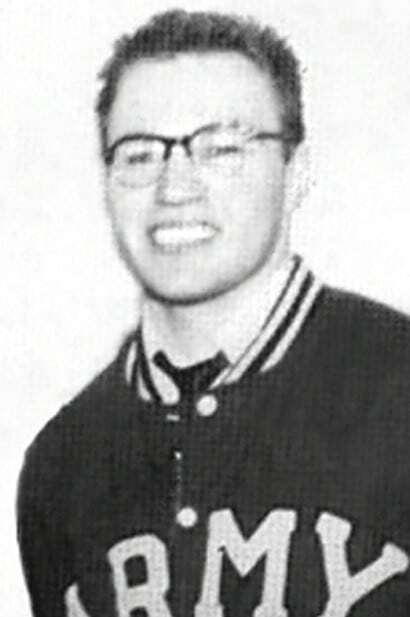 The 1955 – 56 Warriors, coached by Alf Pike, went on to win the Edinburgh Trophy, emblematic of the World’s Minor Professional Hockey Championship. The Manitoba Sports Hall of Fame is a registered charitable organization managed by a volunteer Board of Directors whose mission is to collect, preserve, showcase and celebrate the history and heritage of sport excellence in Manitoba. Sport Manitoba is a not for profit organization and the lead planning, programming and funding agency for the development of amateur sport in Manitoba. Located in the Canada Games Sport for Life Centre, Sport Manitoba partners with over 100 organizations to deliver sport in our province and is responsible for programs including the Manitoba Games powered by Manitoba Hydro, Coaching Manitoba, Team Manitoba, Manitoba Sports Hall of Fame, Fit Kids Healthy Kids, and KidSport. Services provided include the Sport Medicine Clinic, Performance Centre, Fitness Centre and Paul Robson Resource Centre for Leadership and Coaching. Skate Canada Manitoba will be holding their annual Awards Gala evening on Saturday April 27th at the Victoria Inn Hotel and Convention Centre in Winnipeg Manitoba, to celebrate our award recipients. Donna Yee, Chair of Skate Canada Manitoba stated, “this is the time of the year when our organization gathers to recognize the successes of our skaters, coaches, and officials and to thank our many dedicated volunteers”. Congratulations to all our recipients for their dedication and hard work. NOTE: Error in Skate Canada Manitoba Volunteer Coach Award – Cynthia Chartrand she is from the Neepawa Skating Club and NOT the Carberry Skating Club as first indicated. We apologize for the error and any inconvenience the error may have caused. For more information – contact Shauna Marling, Executive Directorskate.exec@sportmanitoba.ca or 204-925-5708 (W), Monday – Friday 8:30 am – 4:30 pm. 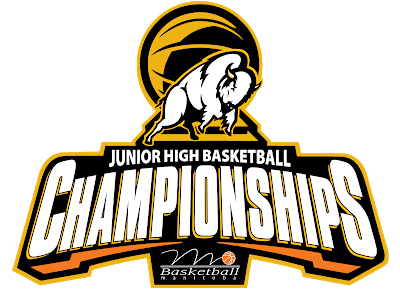 Basketball Manitoba has released the schedules for the 2019 Junior High Basketball Championships (JHBC). 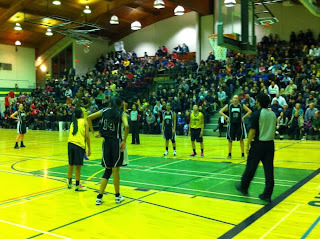 The tournament will run from March 18-21 at Leila North School, Windsor Park Collegiate, Sargent Park School, Sisler High School and Tec Voc High School and features the top Junior High and Middle School teams in the greater Winnipeg area. Teams who submitted applications for the tournament have been seeded based on their overall and league records, tournament play and strength of schedule. WINNIPEG, MB. March 12, 2019 – Jamie Ellis, Event Chairpersons, are pleased to announce that the Neepawa Figure Skating Club and the Skate Canada Manitoba Section are hosting the 2019 Crocus Invitational Synchronized Skating Competition at the Yellowhead Centre in Neepawa, MB on March 16, 2019. Over two hundred skaters on 27 teams will compete at this competition. Nine levels are represented from Beginner II up to Pre-Novice and Adult II, providing the opportunity for very young to adult skaters to participate in synchronized skating. This competition provides teams the opportunity to display the skills they have learned while cheering on teams from across Manitoba. Fans will experience the camaraderie of synchronized skating and its’ team atmosphere during this event. Shauna Marling, Executive Director Skate Canada Manitoba thanked the Neepawa Figure Skating Club and its volunteers for hosting this exciting and fun event. Marling explained that synchronized skating is a specialized discipline of skating involving groups of eight or more skaters performing various group formations and maneuvers. The objective is for the team to perform as one unit by executing circles, blocks, lines, wheels and intersections in unison to the music while demonstrating quality edges, power and flow. Marling added Synchronized Skating is very exciting and fun to watch. Neepawa Figure Skating Club invites everyone to attend this competition and enjoy some excellent Synchronized Skating. Tickets for the Skate Canada Manitoba Crocus Invitational Competition will be available at the door. WINNIPEG, MB. 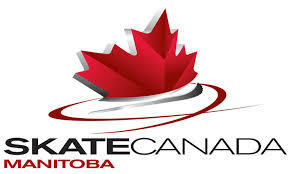 March 4, 2019 – Winkler Skating Club and Skate Canada Manitoba will be hosting the 2019 Skate Manitoba STARSkate Championships on March 9 & 10 at the Winkler Centennial Arena. Tanya Giesbrecht, the Event Chairperson says she is looking forward to watching Manitoba’s young and talented figure skaters over the weekend. Hundreds of young figure skaters competed throughout January and February at six STARSkate regional competitions across the province. These skaters will congregate in Winkler to perform against other Manitoba skaters at their level. This competition will provide skaters the opportunity to demonstrate skills they have been learning throughout the year. Each skater is judged on skill and content based on the stage they are learning. Each stage of this national program emphasizes key skills such as turns, stroking, jumps, spins, and different aspects of performance that have been designated by figure skating experts as necessary for development and progression in the sport. All skaters began Skate Canada’s CanSkate, Learn-to-Skate program and have moved into the STAR 1-5 program. STAR is where figure skating begins! Skaters will also skate in higher levels including STAR 6 to 10 as well as Pre-Juvenile and Juvenile. Shauna Marling, Skate Canada Manitoba’s Executive Director states that this is a very special event. The Manitoba Men’s and Ladies Provincial Champions will be named in the following events: Pre-Juvenile Under 11 Pre-Juvenile Under 13 Juvenile Under 12, and Juvenile Under 14. We invite you all to come out to Winkler and watch our young skaters in action! What an opportunity to see our future skating STARS! View the Competition Schedule . Event Results will be posted on our website following the competition. For more information – contact Shauna Marling, Executive Director skate.exec@sportmanitoba.ca or 204-925-5708 (W), Monday – Friday 8:30 am – 4:30 pm. Media are invited to join us as we open our newest feature exhibit. To celebrate Manitoba’s great female athletes and their contributions to sport, the Manitoba Sports Hall of Fame is showcasing Women in Sport: Celebrating Manitoba Women Past, Present and Future. This exhibit includes artefacts such as Clara Hughes’ complete Olympic medal collection, memorabilia from the All-American Women’s Baseball League, which had 12 players from Manitoba and blazed the trail for women in professional and semi-professional sports, and pieces from Cindy Klassen’s incredible career as a multi-sport athlete. Several other honoured members whose artefacts and stories are throughout the exhibit cases have been invited and will be in the attendance. About Women in Sport: Celebrating Manitoba Women Past, Present and Future will be on display at the Manitoba Sports Hall of Fame, located in the Canada Games Sport for Life Centre at 145 Pacific Avenue, from March 8 through August 2019. The Manitoba Sports Hall of Fame’s mandate is to collect, preserve, showcase and celebrate the history and heritage of sport excellence in Manitoba. Toronto, Ont. 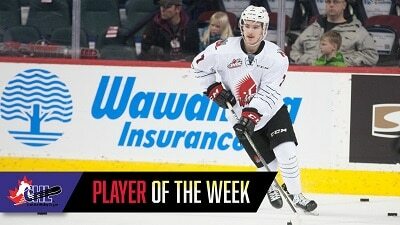 – The Canadian Hockey League today announced that rookie forward Brayden Tracey of the Moose Jaw Warriors is the CHL Player of the Week for the regular season week ending February 24 with 11 points (6G-5A) in four games, including a plus-minus rating of plus-5. Tracey recorded four-consecutive multi-point games last week as the Warriors recorded three wins in four appearances to improve to a 34-16-6-2 record, good for third place in the WHL’s East Division. His week began Monday with a three-point night, including two power-play tallies as the Warriors fell just short of a comeback in a 4-3 loss to the top-seeded Prince Albert Raiders. The 2019 NHL Draft hopeful then followed up that performance four nights later with another two-goal effort in a 4-2 win against the Swift Current Broncos in which he was recognized as the game’s third star. On Saturday, Tracey was named second star after picking up another three points, including one goal and two assists, in a 5-2 victory over the Regina Pats. Tracey then closed out the weekend with another three points as he recorded one goal and two assists in Sunday’s 5-1 win over the Kootenay ICE. A 17-year-old from Calgary, Alta., the 6-foot-0, 174-pound Tracey is starring in his first full season with the Warriors after appearing in five games plus two playoff contests a year ago. In 58 games with Moose Jaw this season, the 21st-overall selection from the 2016 WHL Bantam Draft has tallied 73 points (31G-42A), good for first among CHL rookies and third in team scoring behind fellow forwards Tristin Langan (45-51-96) and Justin Almeida (25-62-87). He is listed 73rd among North American skaters for the 2019 NHL Draft in NHL Central Scouting’s Midterm Rankings. Also considered for the award this week was Detroit Red Wings prospect Joseph Veleno of the Drummondville Voltigeurs with seven points in three games, including two goals and five assists, and Guelph Storm forward and Philadelphia Flyers draft pick Isaac Ratcliffe, who registered seven goals and two assists for nine points in three games.